A study published in Cancel Cell reveals a new protective mechanism of tumour cells and identifies novel therapeutic targets to treat breast cancer, specially the triple negative subtype. This kind of tumour accounts for 15 % of breast cancer cases, and the only treatment to date consists of generic chemotherapy. The results demonstrate that p38αprotects tumour cells by turning on a DNA repair mechanisms. When p38 inhibitors were combined with chemotherapeutic drugs (taxanes), cells showed greater accumulation of genomic instability and more DNA damage. As a consequence many of the cells died and tumour mass shrank considerably. 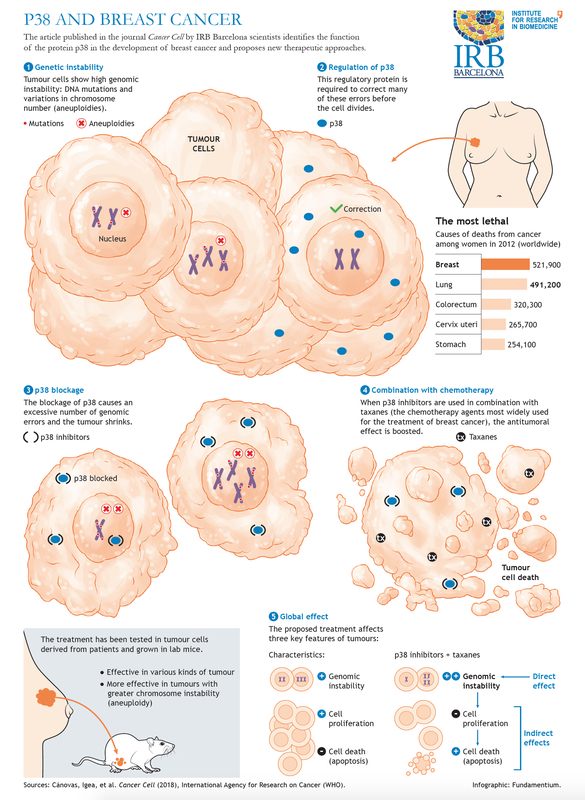 They also showed that the effectiveness of the treatment was dependent on the degree of chromosomal instability od the tumour cells: the greater the instability, the more effective the treatment. Begoña Canovas and Ana Igea are the first authors of the study headed by Angel R. Nebreda, ICREA researcher at the Institute for Research in Biomedicine (IRB Barcelona). The study has been funded by competitive Advanced and Proof of Concept grants from the European Research Council (ERC). Next → Next post: Can a nanovaccine be the solution to pancreatic cancer?